Dr. Thomas Clemens (pictured below) of Keedysville, MD is the editor of The Maryland Campaign of September, 1862 Volume I: South Mountain. 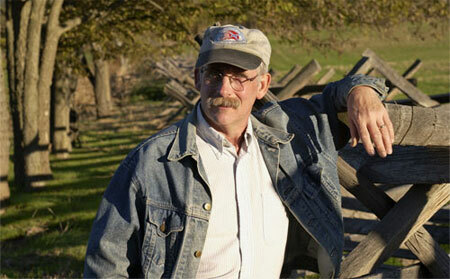 I’ve known Tom for a few years, and serve with him on the board of the Save Historic Antietam Foundation (SHAF). He recently sat down (virtually) for an interview with Bull Runnings. BR: Tom, before we get started can you tell the readers a little bit about yourself? TC: I have Bachelor’s and Masters’ degrees in history from Salisbury State College, now Salisbury University. In 1990 I went to grad school at George Mason University in Fairfax VA where I met Dr. [Joseph L.] Harsh. I graduated in 2002 with my doctorate, and also a firm foundation in the Civil War thanks to Joe Harsh. I have been at Hagerstown Community College for almost 32 years, mostly teaching U.S. History, but occasionally I get to teach a class in Civil War. I also became involved in battlefield preservation in 1985 when Dennis Frye, John Schildt and a lot of other people formed Save Historic Antietam Foundation, Inc. I have been president of the group since 1989, and it is a great experience. I have been a volunteer at Antietam National Battlefield since 1979, doing everything from cannon firing demonstrations to scene restoration work. Living within cannon-shot of the battlefield allows me to walk the ground on a regular basis. That allows me to better understand some of the details of the action of the battle. BR: What first got you interested in Ezra Carman’s papers? TC: Joe Harsh was the person who most inspired me to focus more attention on the Maryland Campaign, something I’d been interested in for years, but not in a serious fashion. I spent a lot of years traveling to battlefields and reenacting with some great folks, including the incomparable Brian Pohanka, but Joe Harsh had so much enthusiasm and so much knowledge, and an incredible ability to ask the right question and do the research to answer it. He became a friend and mentor, in that order. One night sitting in a bar with Joe he asked me what I had in mind for a dissertation. He suggested editing the Ezra Carman manuscript, which he had been using to write his splendid trilogy on the Maryland Campaign. He had typed a lot of it, and I finished the job. He had thought about editing it, but it was too time-consuming. Beware of “gifts” from friends! The size and complexity of the project was unknown to me then, and I thought it would be a relatively simple job. Little did I know how many years it would take to finish the job. BR: How long have you been working on Carman? TC: I began editing Carman’s manuscript in the 1990’s, completed several early chapters to get my degree, but got much more focused after Ted Savas approached me about publishing my work. He has been very supportive. BR: What particular challenges did editing Carman’s manuscript present? TC: What makes the editing so difficult is that I am working backwards compared to the way an author usually works. Instead of obtaining source material and using it to create a narrative, I am tied to a narrative written over 100 years ago, and trying to figure out what source material Carman used to create it. Sometimes he cited sources directly and then it is simply a matter of tracking down old books to verify his work. Far more often he did not cite sources and then it becomes something of a detective game. Tracking down the sources for his work in many instances led to the Official Records of the Union and Confederate Armies in the War of the Rebellion. These books, known as the ORs, were being compiled in the 1880s and Carman had access to them. He also had access to captured Confederate government records, allowing him to cite Muster Rolls and diplomatic correspondence. A few regimental histories were available then and Carman used them on occasion. He also referred to early biographical works on Lee, Jackson and others. For better or worse, Carman also relied on McClellan’s Own Story, and he made much use of the Century Magazine’s Battles and Leaders of the Civil War. If he had only used published sources this work would be simple. But even before Carman was hired on the Antietam battlefield Board they had been soliciting memoir accounts from veterans of both sides. These letters provided many otherwise unpublished material which Carman used liberally. To accurately determine which letters Carman used and how reliable they are it became necessary to organize all the letters into one database. There are over 1,000 letters in the National Archives and Library of Congress Manuscript Division. More letters exist in the New York Public Library and others were scattered into private hands. John M. Gould of the 10th ME Infantry gathered even more letters regarding the fighting in the East Woods and Cornfield area. Carman and Gould swapped information, so it became necessary to add Gould’s letters to the database. Currently there are over 2,200 entries in the file, and I am still adding more. So gathering source material, checking it against current scholarship, and then finally writing a footnote is the bulk of my work. In the first volume there are over 850 footnotes; do you see what I mean about time consumption? BR: What can you tell us about Carman and his project? TC: It is a testament to his thoroughness that Carman created the manuscript at all. He was hired in 1894 to be the “Historical Expert” on the Battlefield Board. He was to layout the field and tour roads, create and place plaques, and monuments and map the field. He also was charged to write a “pamphlet” to advise future leaders in developing the battlefield. This “pamphlet” became the 1,800 page manuscript that has kept me busy for over 18 years. He began writing the manuscript in the late 1890’s and completed it shortly after the turn of the century. I have found notes scribbled in the margins that came from material dated 1905, but most of the work was complete by 1902 or 1903. Mostly what Carman wanted to know was the positions on the field and the identity of opposing forces. This knowledge helped him create the extremely detailed time-sequenced maps to place the combat on the proper locations in the field. In doing that he overlooked or ignored many fascinating details, humorous stories and anecdotes which provide so much richness to our understanding of the battle today. I am constantly fascinated by reading these letters, although their memories may be hazy 30 years after the war, their stories are still captivating. Carman was in many ways the creator of the field as it appears now and the interpretation of it we still recognize today. This is a good thing, and in some ways a bad thing. Carman had his limitations and his prejudices, and they carry over into his manuscript. For example, Carman unabashedly admired Lee and Jackson, often criticized McClellan and positively loathed Halleck. That amazes me when you think that Carman fought through the war in the Union army, and suffered all his later life from Confederate-inflicted battlefield injuries. He clearly did not hold any grudge against his former enemies. BR: What will Carman’s manuscript – and your annotations – tell us about the Maryland Campaign that we don’t already know? TC: For many years Carman’s manuscript languished in the Library of Congress. A few people read parts of it, the battlefield had a copy, and built their interpretive plan around it, but that was about it. A few historians looked at it, but the writing is quite small and difficult to read. That is a shame because Carman had the “correct” story about a lot of things that several historians botched in their books. For example, Carman correctly stated that the staff officer who verified Chilton’s handwriting on S.O. 191 knew Chilton through a business relationship. Other accounts mistakenly say they were in the U.S. army together. These mistakes happened because Carman did not document how he knew things, and people weren’t sure he was right. That is exactly what I am trying to do; inform the reader about where Carman is correct, and where he is questionable. There were also several “stories” that Carman included in his manuscript that had no known source other than him. I am especially thrilled to say that by careful attention to the letters I have solved several of these “Carmanisms,” as I call them. For example, there is a story in the early part of the campaign where Jackson, reaching the vicinity of Buckeystown on September 6, asked Col. E. V. “Lige” White to ride with him. Together they rode almost back to the Potomac and then returned to camp, Jackson never speaking during the entire ride. Nobody ever knew where that story came from until I discovered the letter from White in one of the letter collections. BR: What is unique about your edition of Carman’s manuscript? TC: It is the attention to the letters and the analysis of Carman’s historical method that make my edition much different from the other published version of the manuscript. While the [Joseph] Pierro edition has almost as many footnotes, he was content to identify sources; I go the next step in analyzing them. For instance, Carman relied on Battles and Leaders for much information, especially in the early part of the campaign. Pierro correctly noted that fact, but I go on to point out that many writers in that work are embellishing or fabricating what they wrote. Confederate General John Walker is a good example: he claims to know much of the strategic aspects of Lee’s plans in 1882, but in his after-action reports in 1862 he seemed not to know much at all. I also believe that maps are critical to understanding the narrative and so there are 22 detailed maps in my edition. In fact, I am thrilled with the maps – Gene Thorp did an outstanding job creating them. Some pictures are included too, but not the usual Gardner photos of the battlefield. I included some lesser-known photos mostly from the time that Carman was writing. It seemed logical to use pictures that showed the sites as they looked to Carman. Because of the in-depth footnoting and more readable format in my version the book runs a bit longer in total pages. The publisher and I decided to break it into two volumes for the convenience of the reader. The price [of both volumes combined] will still be less than the earlier all-in-one volume. BR: What’s next? Any plans to go beyond the second volume, like editing the papers? TC: What’s next? – Right now I am working on Volume II, as well as reading collating and categorizing letters from the John M. Gould collection and also some from the New York collection into my database. All of this work is very time-consuming so you won’t see the second volume anytime soon. Ultimately there are a lot of other things I’d like to see published. Some of the letters are absolute gems and it would be nice to see them in print. The database I am creating would allow readers to see who wrote to Gould or the Battlefield Board. I also am creating a biographical register with a brief bio of every person mentioned in the manuscript. Whether Savas-Beatie will want to do that is unclear at this time, but these things are on my wish list. Thanks Tom. We look forward to seeing more of your ground-breaking work in print soon. What a great interview! Thanks to both of you. Thank you for the interview with Tom Clemens. If anyone would like more information about the author or the book, including an excerpt, they can check at http://www.savasbeatie.com/books/book_page.php?bookVAR=M_CAMPAIGN&bookType=about&authorID1=TGClemens&authorID2=empty&authorID3=empty&authorID4=empty&authorID5=empty.